Gear up for the 23rd Annual Carrie Edgmon Bicycle Safety Rodeo! 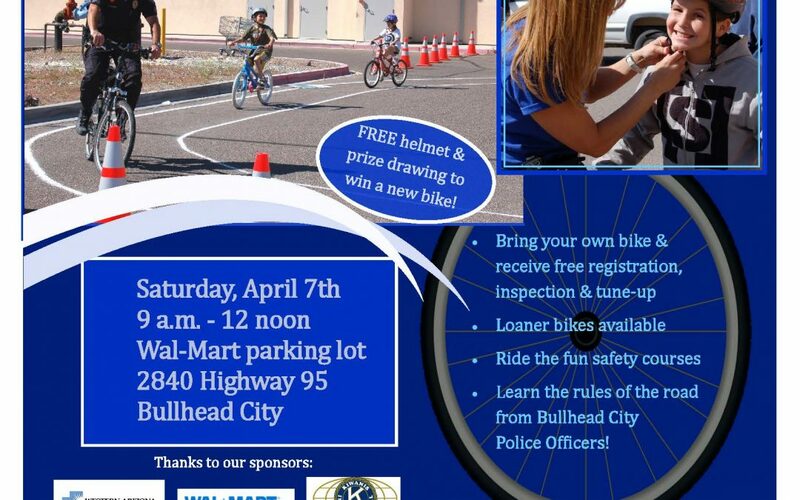 The event will be held on Saturday, April 7th in the south Wal-Mart parking lot, 2840 Hwy 95, from 9 a.m. – 12 noon. The event is sponsored by the Bullhead City Police and Fire Departments, Wal-Mart and Western Arizona Regional Medical Center (WARMC). Children are encouraged to bring their own bicycles to receive free bicycle registration, inspection and tune-ups performed by the Community Emergency Response Team (CERT). Bicycle parts for the tune ups are provided by the Morning Kiwanis Club. Children then put their safety skills and knowledge to the test as they ride through several safety courses. Police officers are on hand to teach them the rules of the road. The first 120 kids will also receive a free helmet, plus participants can enter a prize drawing to win a new bike! The Bike Safety Rodeo is open to the public at no cost.